EIA recently released State Energy Data System estimates for net energy supply, which provide data on each state’s total primary energy production and consumption. Wyoming, Texas, Pennsylvania, West Virginia, and North Dakota ranked as the top five net suppliers of energy in 2015. Overall, 12 states produced more primary energy than they consumed, while 38 states and the District of Columbia were net recipients of energy. Note: Natural gas plant liquids are included under petroleum. Ethanol is included under renewables. Wyoming has the smallest population of any state and ranks 42nd out of 51 in terms of energy consumption. Wyoming leads the nation in coal production, accounting for more than 40% of the national total in 2015, and is the sixth-highest natural gas-producing state. In recent years, Wyoming coal—particularly from the Powder River Basin—has been used at power plants in more than 30 states. Most of the state’s natural gas is shipped through pipelines crossing into Utah and Nebraska and delivered to markets in both the Midwest and West Coast. Texas leads the nation in both energy production and consumption. Texas, which produces 41% more total energy than it consumes, is also a leading net energy exporter. 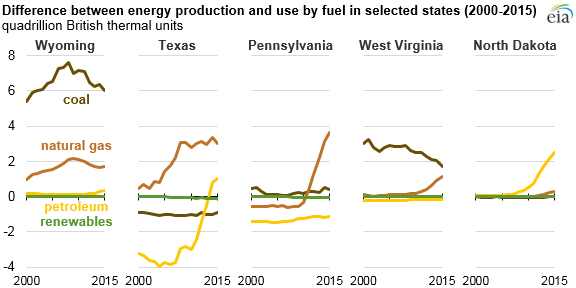 The state accounts for more than one-third of U.S. crude oil production, nearly one-third of natural gas production, and more than one-fourth of wind-powered electricity generation. For each of those fuels, Texas is the largest producing state. Texas leads the nation in crude oil refining capacity and supplies petroleum products to virtually every major U.S. market east of the Rocky Mountains. The state also has the most natural gas hubs in the nation, and it supplies natural gas across the United States and to Mexico. Pennsylvania’s growth in natural gas production has made it a major net exporter of energy in recent years. The state’s marketed natural gas production grew from 573 billion cubic feet in 2010 to 5,264 billion cubic feet in 2016 as a result of the development of resources in the Marcellus and Utica shales. Pennsylvania is also one of the five largest producers of U.S. coal. Prior to the advent of shale gas production, Pennsylvania was a net importer of natural gas. With rapid growth in natural gas production, pipelines are now being reconfigured to send natural gas out of the state to the Mid-Atlantic and Midwest regions. Pennsylvania’s coal is used for electricity generation throughout the East Coast and Midwest; about one-fifth is exported abroad. West Virginia’s coal production has declined, but the state was still the second-leading coal producer in the nation in 2015, accounting for more than one-tenth of the U.S. total. Like Pennsylvania, West Virginia’s development of resources in the Marcellus and Utica shales has placed it among the top ten natural gas-producing states. About two dozen states receive West Virginia coal, and about one-quarter of the coal leaving the state is shipped abroad. North Dakota’s crude oil production increased from 108,000 barrels per day (b/d) in 2006 to more than one million b/d in 2016, driven by the continued development of the Bakken shale formation. Since 2012, North Dakota has been the second-largest crude oil-producing state. The state also accounted for about 2% of the national total of both natural gas and coal production in 2015. By contrast, populous states such as California, Florida, and New York, which have relatively limited energy production but significant energy use, were the top energy net recipients in 2015. All three states rely on petroleum from elsewhere to meet demand in the transportation sector. Natural gas is also the leading fuel for electricity generation in all three states; most homes in both California and New York primarily heat with natural gas as well. 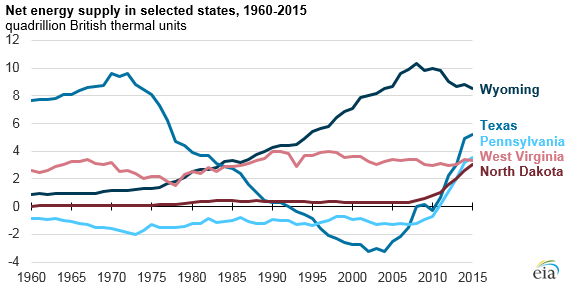 More information on state-level energy production, consumption, prices, and expenditures from 1970 through 2015 is available on EIA’s State Energy Data System.